NOTE: Wally is owned by Erik Larsen and Gary S. Carlson. 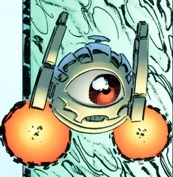 Wally is the sentient robotic companion to the Kalyptan soldier who is known on Earth as the hero Vanguard. He accompanied his best friend to Earth when the War-Wardens of the Alliance dispatched Vanguard to the planet to watch out for their galactic enemies, the Tyrrus Combine. Vanguard and Wally soon fell in love with human society and enjoyed their mission, spending the majority of their time aboard their spaceship watching television. Whenever Vanguard has gone on a mission or had any problems, Wally is always there to assist his partner. One of the biggest events to happen in Wally’s life was his slaying of former world dictator Sebastian Knan, AKA Cyberface. Cyberface has tried to take over Wally, but Wally was able to resist and blown his head clean off. During the Tyrrus Combine’s invasion, Wally proves to be a huge asset. During the attack of Vanguard ship, Wally is able to take over the Mekka-Drones even though the merger is not without faults. He is able to teleport Vanguard and his crew to safety while self-destructing the ship he is on full of Tyrraneans. However, it turned out to not be a sad day as Wally was able to survive and even created a new form for himself. When Vanguard decides to head back home to his home planet, Wally is by his side. They arrive on the planet which is now full of death as everything is dead. Wally nearly dies as he was effected by the same gas that killed most of the Tyrraneans due to his new body makeup. Wally is later captured by the drones who had been servants on the planet, but is saved by MODEM. Wally remains with Vanguard in order to rebuild his ship.